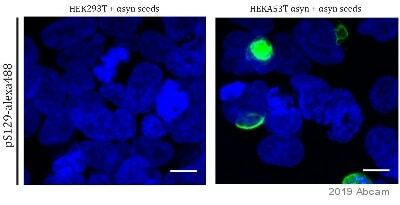 This antibody only detects alpha synuclein phosphorylated on Ser129. IHC-P: This antibody showed no staining in human hippocampus normal brain and showed staining in Parkinson's brain as expected. Synthetic peptide within Human Alpha-synuclein aa 100 to the C-terminus. The exact sequence is proprietary. 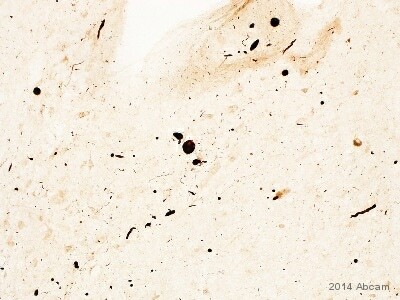 IHC-P: Human Parkinson Substantia Nigra tissue. WB: Sarkosyl-insoluble brain extract from mice transgenic for PrPA53T alpha-synuclein; Recombinant alpha-synuclein phosphorylated at S129. Our Abpromise guarantee covers the use of ab51253 in the following tested applications. WB 1/5000. Detects a band of approximately 18 kDa (predicted molecular weight: 14 kDa).Can be blocked with Alpha-synuclein (phospho S129) peptide (ab188826). Good results have been obtained by treating the membrane with 0.4% PFA for 30 min at room temperature before blocking it with 5% milk. Is unsuitable for Flow Cyt,IHC-Fr or IP. Western blot - Anti-Alpha-synuclein (phospho S129) antibody [EP1536Y] (ab51253)This image is courtesy of Professor Michael Goedert’s team (Sophie Morgan and Masami Masuda-Suzukake). IHC image of alpha Synuclein (phospho S129) staining in Human Parkinson Substantia Nigra formalin fixed paraffin embedded tissue section*, performed on a Leica Bond™ system using the standard protocol F. The section was pre-treated using heat mediated antigen retrieval with sodium citrate buffer (pH6, epitope retrieval solution 1) for 20 mins. The section was then incubated with ab51253, 10µg/ml, for 15 mins at room temperature and detected using an HRP conjugated compact polymer system. DAB was used as the chromogen. The section was then counterstained with haematoxylin and mounted with DPX. The inset negative control image is taken from an identical assay performed on Human normal Substantia Nigra. IHC image of alpha Synuclein (phospho S129) staining in free floating tgM83+/- or tgM83+/+ mouse brain tissue. The section was incubated with ab51253, 1/5000, for 15 hours at 4oC and detected using a Biotinylated conjugated Anti-Rabbit monocloal antibody, 1/200. Direct ELISA antibody dose-response curve using ab51253. Antibody concentration of 0-5000 ng/mL. Antigen concentration of 1000 ng/mL. 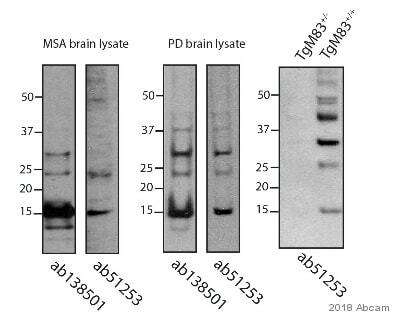 An alkaline phosphatase conjugated goat anti-rabbit IgG (1/1000) was used as the secondary antibody. Dot blot analysis of alpha Synuclein (pS129) peptide (Lane 1), alpha Synuclein (unmodified) peptide (Lane 2) labelling alpha Synuclein (pS129) with ab51253 at a dilution of 1/1000. Peroxidase conjugated goat anti-rabbit IgG (H+L) was used as the secondary antibody at a dilution of 1/2500. Publishing research using ab51253? Please let us know so that we can cite the reference in this datasheet. 1) Could this product recognize rat samples or not though it is written "Does not react with Rat" on your data sheet? 2) What rat samples did you test? 1)Our initial testing with rat showed negative and that the antibody is not recommended for use in rat. However, based on sequence analysis, it shares 100% identity with rat. 2)We previously tested rat brain, heart, kidney and spleen tissues lyates. We acctually do have problems with your antibody, but it's from a different batch (Lot.No. GR93844). We tried both Western blot and immunofluorecens (whole primary neurons grown on coverslips) but so far nothing has worked. A collegue of ours here at Lund University recommended this antibody and the plan is to next week try some of his batch to see if it works or if it's our samples that are the problem. Please let me know if others have problem with the same batch we got or we will continue to test it asap. I am sorry to hear of the trouble which you have been experiencing when lot no. GR93844. We have not seen this issue with other lots of ab51253. This product is covered by our Abpromise guarantee. We are happy provide scientific support at any time. If you are using the product in species and applications listed on the datasheet and contact us within six months of purchase, we are also happy to replace or refund the product should we not be able to help you to resolve the issue. I do hope that you are able to resolve whether this is an antibody or sample issue.If you find that the issue is with the antibody please do not hesitate to contact our Scientific Support group at technical@abcam.com who will be very happy to help you resolve any issue with this product. Je vous remercie pour votre réponse qui explicite les soucis que nous avons rencontrés récemment. Nous avons eu ce problème de faible réactivité avec les 2 derniers tubes, ainsi qu’un autre reçu précédemment. D’autre part, il y avait eu également une rupture de stock dû à des problèmes de production et/ou qualité l’année dernière qui avait perturbé durablement notre activité de recherche avec cet anticorps sur lequel nous comptions. En conclusion, nous souhaiterions pouvoir bénéficier de l’envoi gratuit de 3 tubes, car il est plus compliqué de disposer d’avoir au niveau de la comptabilité. Nous formulons le souhait d’une qualité stable des prochains lots de cet anticorps, que nous allons sans doute être obligés de vérifier à réception. En cas de variation de sensibilité de l’anticorps observé dans votre laboratoire, nous serions intéressés d’avoir cette information en amont, avant de le découvrir par nous même. Nous sommes très désolé de cette inconvenance. Veuillez croire que la qualité de nos produits est très important pour nous. J'ai transmis votre feedback aussi au laboratoire. Nous avons actuellement trois autres tube du même lot en stock. Est-ce que ce lot vous convient et est-ce que vous souhaitez trois tubes de celui-ci? Autrement, je peux aussi vous envoyer des anticorps alternatives, contre une autre protéine,si vous souhaitez. Vous avez le droit à trois tubes d'anticorps et c'est votre choix lesquels vous souhaitez.